Dr. Leitner was one of the few reasons I was even able to walk in the last few months of my pregnancy. I was diagnosed at 20 weeks with Symphysis Pubis Dysfunction (SPD) and was in constant pain. With regular visits I was able to keep the pain of my SPD to a manageable level. They were also able to help relieve the regular aches and pains associated with pregnancy. I've been seeing Dr. Peter Leitner for many years and he has helped me countless times in eliminating and/or easing my back pain. He truly has a gift + the training to take care of my achy-breaky back. Peter rocks! No need to look any further. A perfect blend of the physical and the intuitive. I've been a client of Peter's for over ten years now and depend on my monthly visits with him to keep me aligned, both in terms of my body and my soul. His holistic approach to chiropractic medicine is a great way to take care of yourself pro-actively rather than just waiting until your body lets you know there is a problem going on. The combination of a car accident several years ago coupled with a computer/desk-heavy job has required ongoing care. I've seen Dr. Leitner for over 4 years, and nothing has helped my back pain more. His adjustments are gentle but effective and always help my body return to proper alignment. Dr. Leitner takes time to closely listen and thoroughly observe in order to determine the most effective treatment. His approach is deeply knowledgeable and holistic, including not only physical adjustments, but help with stress relief, sleeplessness, nutrition and exercise, and overall physical, mental, and emotional health and wellness. For example, Dr. Leitner's methods as well as compassionate bedside manner helped me greatly during a period of grieving. ​I have also seen Dr. Taylor, who assisted me when I had a rib out. 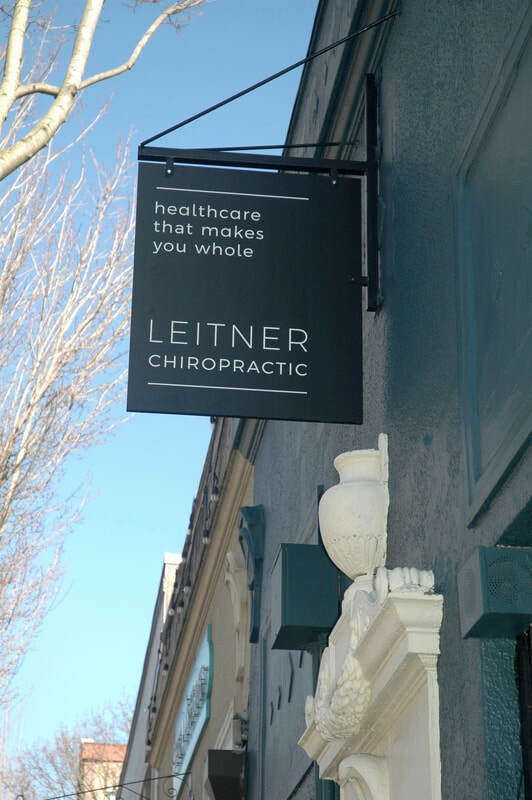 Like Dr. Leitner, he is very thorough and comprehensive in his approach, having helped me understand exactly what was going on with my body, why, and to manage my pain and recovery from home in between appointments. It is always a pleasure to go to my appointments, from friendly reception staff to a calm, quiet, comfortable space. I fully trust Dr. Leitner and Dr. Taylor with my health needs and can understand why they are so beloved among patients and the community. Finally, if you are skeptical about trying chiropractic care for the first time, don't be! The myths will be debunked and you'll immediately notice results and improvements. Dr. Leitner and Dr. Taylor are a great fit for first-time chiropractic patients. I am grateful to them both for helping me feel my best. I am an MD physician and have the usual MD skepticism about many complementary therapies but have kept my mind open to the options. A few years ago I began having some back problems and Peter was recommended to me. He has been a lifesaver. A:though my back still occasionally acts up, Peter has helped me keep it to a minimum. He also acts as a counselor - always checking on other aspects of my life that may be leading to stress and contributing to the back issues. I initially started seeing Peter for neck pain, one day I was fine, the next I couldn't move. It happened at the most inconvenient times and not surprisingly during the most stressful. He had been referred to me for years but I don't think I really understood what Chiropractic care was - or what it COULD be. My initial visit lead to an almost immediate relief of pain. Peter is a remarkable healer, who is confident and gentle in his adjustments. He has true understanding of the mind body connection and treats you holistically. I returned for a period of time and became more in touch with my body. It turns out I was twisting the vertebrae in my neck from bad sleeping habits...all Peter had to say to me was, "picture looking over your shoulder for 8 hours while at work, that is what you are doing in your sleep" and so after a lifetime of sleeping on my stomach I corrected myself. He has a unique and baffling ability to identify points of pain or discomfort just from watching you walk to the treatment room. You sit down, and he puts his hand on your rib and you're like. EXACTLY!, within a few mins and a simple adjustment you are realigned and his advice cuts through all of the BS you get or don't get from other doctors. When he asks you how you are he really wants to know, and if you want he can talk you through your pain and stress while popping a rib back in place. Surprisingly the two threads of therapeutic treatment go well together! Recently I was in two unfortunate and significant car accidents in the same year, my treatment became more urgent and regular. I know that the work he did was not only corrective but prevented me from living with lifelong pain. I have fully recovered and see Peter for regular but not obsessive maintenance. Although I will admit if insurance covered it, Peter might be my primary doctor, you cannot underestimate what being misaligned does to the rest of your mental and physical health. When he finishes a treatment he always says "I think you will feel much better now" and he is right. You emerge slowly and realize your body is much happier and so are you. Bonus points for having a beautiful, calm office and treatment rooms with real art on the walls, a stellar staff and letting patients stay in the treatment rooms after your adjustment to return comfortably to the real world.